Found in many parts of the world including Europe, Asia and the US, St John’s wort (Hypericum perforatum L.) is a bushy perennial plant with distinctive yellow, five-petalled flowers and paired oval, yellow-green leaves with tiny dots. At first glance these seem to be small perforations or holes hence the Latin name’ perforatum’. However, they are in fact tiny glands, which when pressed release the essential plant oils characteristic of the plant. St John’s wort grows wild, thriving in woods, hedgerows, roadsides and meadows. The yellow flowers yield a deep red oil – the colour comes from hypericin, a red pigment believed to be one of the active ingredients along with hyperforin. The plant also contains flavonoids and tannins. Some believe St John’s wort takes its name from the knights of St John of Jerusalem who used it as a wound herb on the crusade battlefields, while others suggest it is named after St John the Baptist as it was traditionally collected on St John’s Day, June 24th. Although a traditional wound herb and painkiller, it is now better known as a natural mood booster. Indeed it is often referred to as the sunshine herb in recognition of its uplifting properties. St John’s wort has been used to treat nerve disorders for more than 2000 years. It was popular in ancient Greece and Rome as a healing remedy for wounds, as well as sores, burns, bruises and nerve pains. It was also thought to ward off evil spirits and the insane were often encouraged to drink an infusion in an attempt to ward off madness. St John’s wort was also woven into wreaths to keep the devil away. Currently at least 30 studies on more than 1,700 patients show that St John’s wort can be an effective remedy for mood disorders without the side effects of more conventional anti-depressants. In one study comparing St John’s wort to light therapy for the treatment of SAD, a severe form of the winter blues thought to be brought on by the lack of sunlight that occurs in autumn and winter, the researchers concluded that St John’s wort was just as effective. The herb they wrote ‘brings light into dark places’. 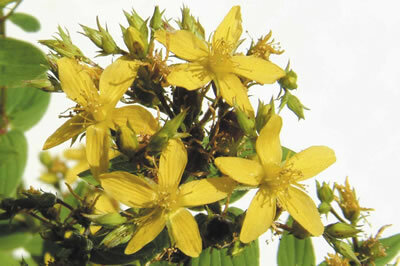 St John’s Wort may also be useful to women who experience low mood during menopause. St John’s Wort and Black Cohosh, when used together, also seem to be particularly effective at relieving menopausal mood swings. Since April 2014, all herbal medicines for sale in the UK and Europe must be approved by the Medicines & Healthcare Products Regulatory Agency (MHRA) having been rigorously checked for safety and quality. They must also display the Traditional Herbal Registration ‘THR’ logo on their pack. Registered herbal medicines containing St John’s wort are used today to relieve the symptoms of slightly low mood and mild anxiety based on traditional use only. A traditional herbal medicinal product used for the relief of sore, minor cuts and wounds. A traditional herbal medicinal product used for the relief of symptoms of the menopause, including hot flushes, night sweats, slightly low mood and mild anxiety, based on traditional use only. Vitabiotics St John’s Wort is a traditional herbal medicinal product used to relieve the symptoms of slightly low mood and mild anxiety, exclusively based upon long-standing use as a traditional remedy.